The SEFAA annual Square Foot Fiber Pin-Up Show opened on Sunday 10 March. This year’s show has 54 pieces in a range of techniques. Quilting, silk painting, weaving, felting, printing, knit, and crochet are all represented. Several of the works feature recycled materials or materials that are usually discarded. At least two works employ handspun yarns. Visitors to the show are invited to cast a ballot for their three favorite pieces. The top 13 will be featured in the 2014 SEFAA calendar. Many of the works are also for sale — just bid on them in the silent auction. After Thursday 21 April, the show will travel to Shellman, GA. More information on the SEFAA website here. Stephanie Jolluck (www.coleccion-luna.myshopify.com) started Coleccion Luna in 1999 in order to empower women, help alleviate their poverty, sustainably preserve their traditions, and promote cultural diversity and understanding. 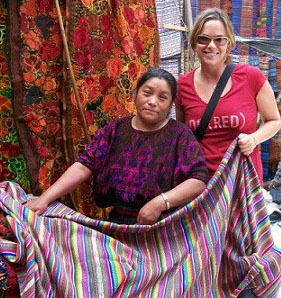 She travels several times each year to the Highland Region of Guatemala where she works directly with artisans designing textile products from reclaimed Mayan indigenous clothing. The textiles are hand-woven on back-strap looms and hand-embroidered. In addition, Stephanie has worked with the women to create a line of beaded jewelry and accessories. For TASA’s Winter 2013 program, textile artist Lucinda Carlstrom invited TASA members to her studio. In her informative and engaging program, Lucinda shared the process and step-by-step procedure by which she creates her award-winning paper, silk, gold and bronze leaf piecework quilt art. She also described one of her works-in-progress, a quilted map commissioned for Rutgers University. TASA members enjoyed seeing the beautiful vintage kimono fabric, the Japanese keyosi paper—made with fibers that are steamed, beaten and separated by hand—and the thin sheets of real gold leaf Lucinda uses in her art. In addition to the silk from kimonos, Lucinda repurposes silks from thrift store clothing and out-dated silk yardage from special fabric stores. Crowded into Lucinda’s two-story workspace are her sewing machine, laminating machine, bins and bags of cut fabric sorted by color and framed pieces of art ready to sell. Lucinda will showing and selling her work at the Decatur Arts Festival, May 18-19 and the Virginia Highland Summerfest, June 1-2. Post supplied by Gail Goodwin; images by Anne Godsey.